In August 2018, Spaces for Change’s director, Victoria Ohaeri, was appointed member of the Lagos State Ministry of Housing Committee on Affordable Housing. The inauguration of the Committee came on the heels of sustained multi-stakeholder advocacy for the delivery of affordable housing for the low-income populations in the city of Lagos. At one such multi-stakeholder interactive session held on July 27, 2018, S4C joined Artic Infrastructure and Heinrich Boll Stiftung at a high-level policy dialogue with the Lagos State Ministry of Housing where multi-level pathways for achieving affordable housing delivery were presented to ministry officials and policymakers. That presentation laid the foundation for the inauguration of the Committee. The housing deficit in Nigeria is presently estimated at 17,000,000 million and Lagos State alone accounts for about 3,000,000 (17.65%) of this estimate. This shows that the challenges of housing in Lagos State needs to be treated as a matter of urgency just like security. The proposed Lagos State Housing Trust Fund will assist prospective home owners to access the currently available mortgage plan, as well as other proposed mortgage options that will be provided by the Lagos State Government. In one of the committee meetings, the Lagos State Commissioner of Housing, Prince Gbolahan Lawal charged committee members to come up with pragmatic recommendations for meeting the housing needs of low-income earners in Lagos State. Drawing inspiration from the Lagos State Security Trust Fund, Committee members examined an array of models for designing and implementing a Lagos Housing Trust Fund, leveraging on resources pooled from different sources, including the state government, local and international organizations, as well as formal and informal sectors in the state. Existing methods of accessing housing in the formal market in Lagos include the Rent-to-Own Scheme, mortgages from private mortgage institutions and commercial banks, installment payment plans, and outright purchase plans. The Committee found that the beneficiaries of these programs are usually residents engaged in paid or formal employment. The informal sector is yet to benefit from these options due to income uncertainties, limited financial resources, geometric population rise among other factors. This further informed the need to design the Lagos State Housing Fund in such a way that offers residents multiple revenue and funding sources in order to expand their access to affordable housing. In terms of the operational model and institutional framework, the proposed Lagos Housing Trust Fund will have six categories cutting across namely: Empowerment fund, Habitat fund, Housing Guarantee fund, Construction Fund, Innovation and Technology fund and Green fund. It will also establish other sub-mechanisms to drive implementation such as the Lagos Housing Development Fund. This will serve as a financial mechanism that responds to the challenges of housing finance in Lagos State. 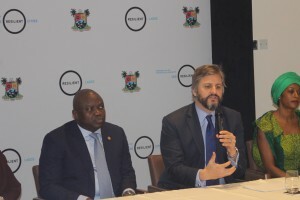 The Housing Development Fund will pool funding from the private and public sector, and the funds will be managed by the Lagos Housing Trust Fund with necessary support, as needs may arise, from the Federal Ministry of Finance, the Lagos Ministry of Finance, Nigeria Mortgage Refinance Company, and Investment Banks. Through the above mechanisms, the Lagos State Government is making robust plans to transform, regenerate and revitalize housing development in the city in order to make Lagos a competitive performer globally. The fund will cover both the supply and demand aspect of the market and will be tied to the overall development of the city of Lagos. An interim report detailing the committee’s findings, suggestions and recommendations, including the legal framework for onward transmission to the executive and legislative arms of the government, is being expected.